Once upon a time, in a far away land, the world was peaceful and there was a beautifully dressed, perfectly fit, well-rested, wrinkle-free, stress-free, homemaker. She spent her days drinking coffee, attending to her perfect and well behaved children while contemplating which new shade of lipstick she should wear to highlight her strong cheekbones and natural glow. She was awesome. But then she died, and I came around. Yes, I. I in my “sloppy pants” – as Georgia calls them. I in all my makeup free glory. I with my “bumpy hair” – as Owen pointed out. I in my messy kitchen, spit-up-on tshirt, and crusty house. I. But I have the best traditional ratatouille recipe known to man in my back pocket. So even if the house is a hot mess, as am I, as are my children, as is the garden, as is the car, as is the barnyard, as is life, I don’t care. Because ratatouille we eat. 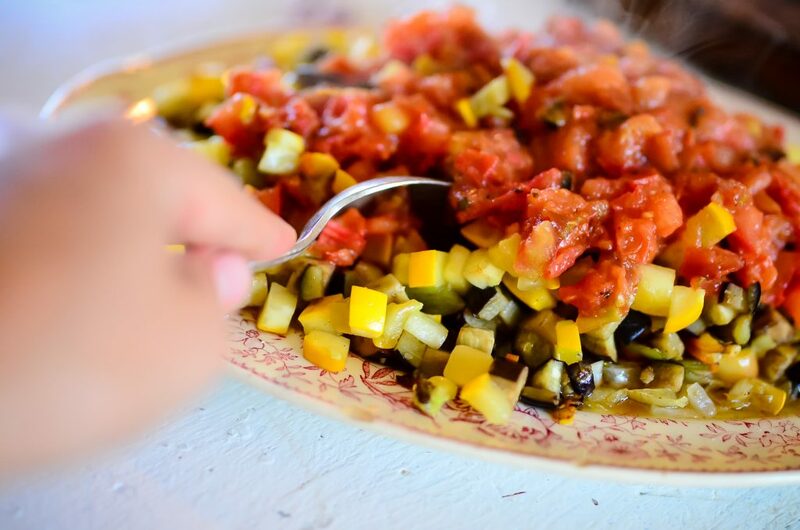 Ratatouille is a fancy word for diced and sauteed summer vegetables – onions, peppers, eggplant, zucchini, and tomatoes. So much more than the sum of it’s parts. See what I mean? It’s like joy on a plate. 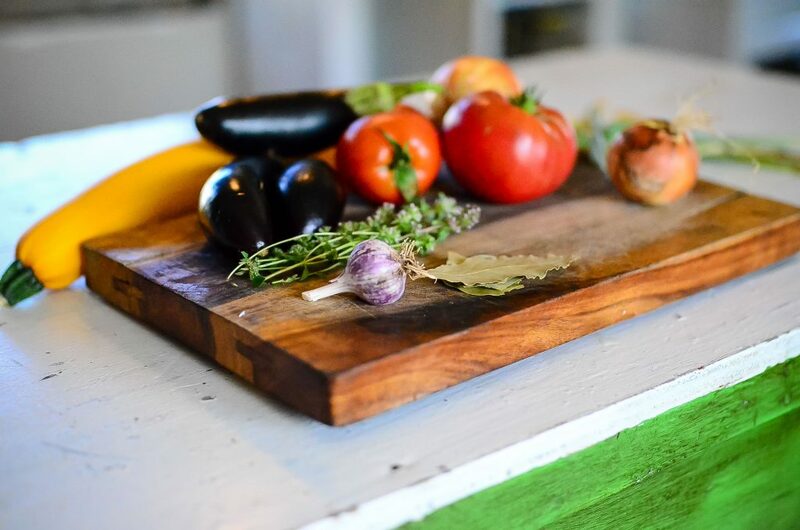 Each summer,when the sun heats up the garden bed and those long-day vegetables begin to ripen, traditional ratatouille is the very first dish on my to-make list. Year upon year, I spend July and August and September engorging myself on the very best summer veg the garden has to offer and the majority of the time, it’s in the form of this traditional ratatouille recipe. Because why mess with success, baby? Only use the very best produce you can find. Make sure it’s fully ripe. Sauté each vegetable separately. This ensures that some vegetables aren’t overdone while others are underdone. Each vegetable must be cooked separately to it’s perfect “doneness”. Let it rest. Give the ratatouille at least 15 minutes, up to a few hours, to rest. This allows the vegetables to relax and the flavors to mingle. A mingled ratatouille is a delicious ratatouille. Don’t skip the bay leaves. I’m not exactly sure what it is about them, but they add a deep dimension to this dish that cannot be skipped. I’ve made it without them a few times and it just doesn’t sing to my heart and sooth my soul like it does when I’ve used bay leaves. And, as we all know, I love it when food sings to my heart and soothes my soul. So bay leaf we must. Salt and pepper each vegetable individually. Some vegetables require more salt than others, so salting each vegetable individually as you cook it helps to dial in the level perfectly. Seed the tomatoes (more on this below). 2. Heat a medium-sized cast iron skillet up on your stove. Add in the olive oil, thyme, and bay leaves. Crush the garlic, remove the skins, and add the whole cloves into the skillet as well. This is our base of ingredients that we will keep in there the entire time. 3. 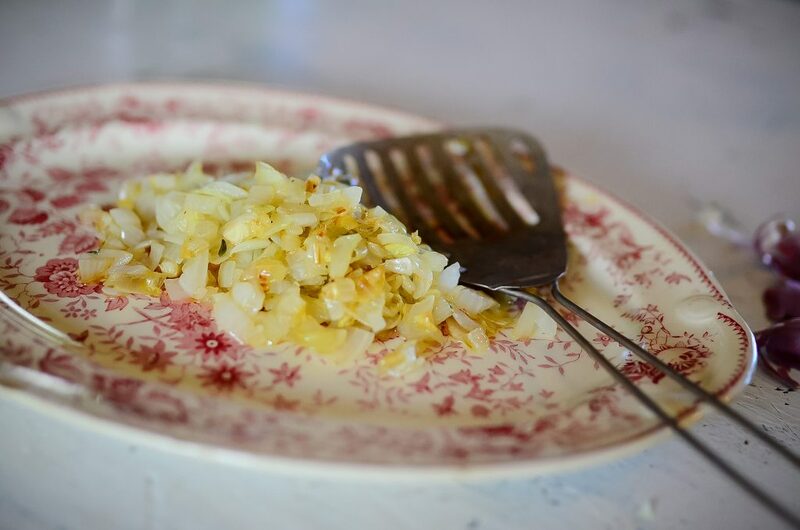 Over medium heat, sauté the onion in the olive oil, garlic, and herbs until just soft. Leave it with the teeniest bit of crunch. 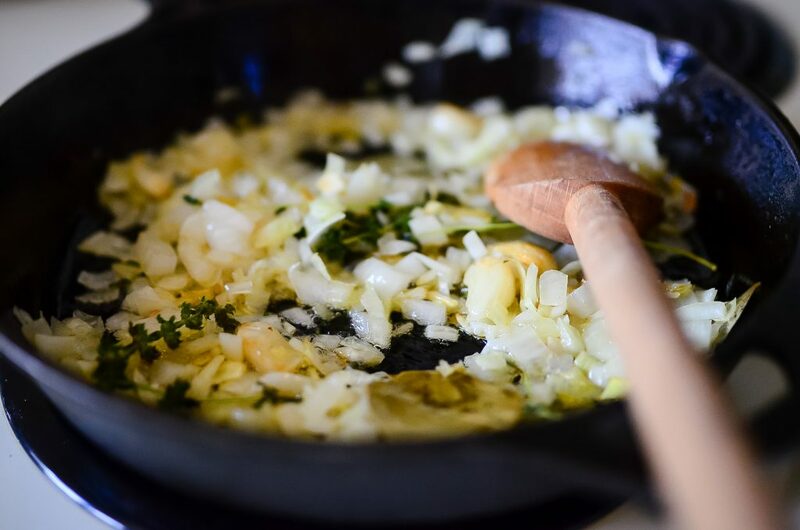 Remove the onion to a place, reserving the thyme, bay leaves, and garlic in the pan. 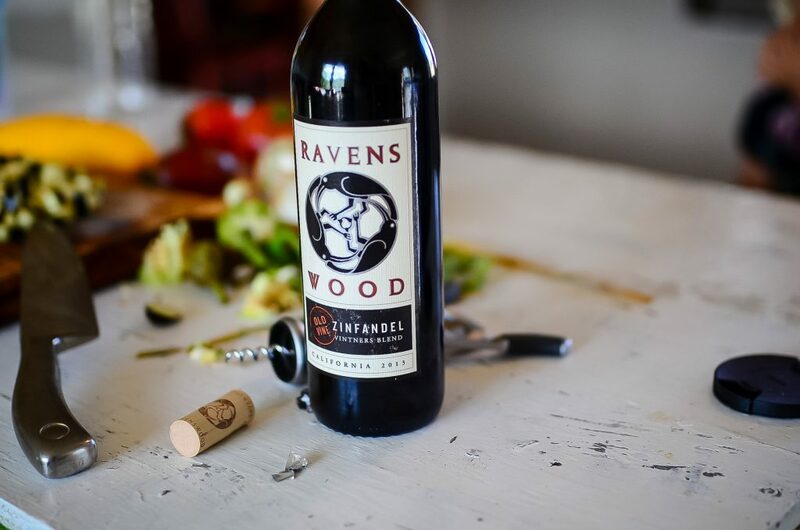 Oh, by the way, now is a good time to open up a bottle of Zinfandel. Because – remember? – you’re a hot mess. 4. Now it’s the pepper’s turn. Here is my random assortment that Owen so graciously pulled for me from the garden. Dice the peppers and toss them into the skillet. Add a bit more olive oil, if need be, to keep it all moist and sauté-like. 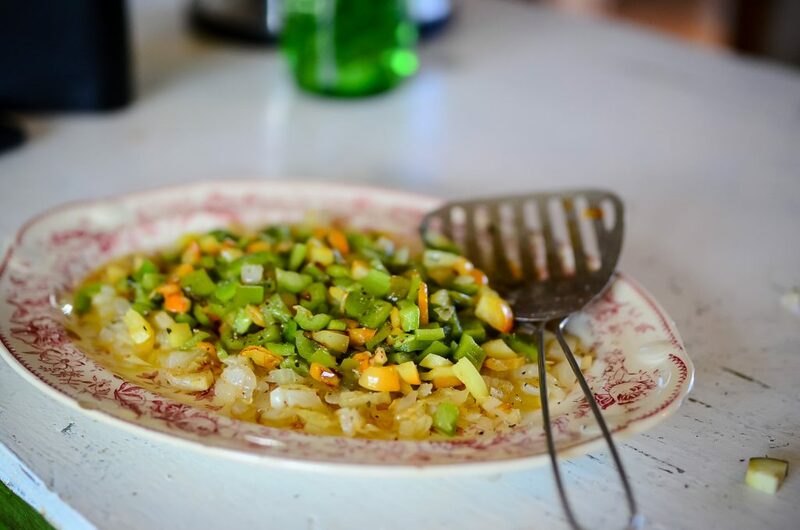 Remove the peppers when they’re still slightly crunchy and place atop the onions, reserving the thyme, bay leaves and garlic in the pan – once again. Are you catching onto the pattern? 5. Next, the eggplant. Diced and sauté. Eggplant has a tendency to soak up the olive oil, so add a bit more if need be. Don’t overcook the eggplant! Ain’t nobody like overcooked eggplant. Remove the eggplant and once again, repeat the same process with the zucchini. 6. And lastly, the tomatoes. Now, don’t forget this secret: SEED THE TOMATOES. Seeds are wet. Wet is soggy. Ratatouille should not be soggy. And Amen. 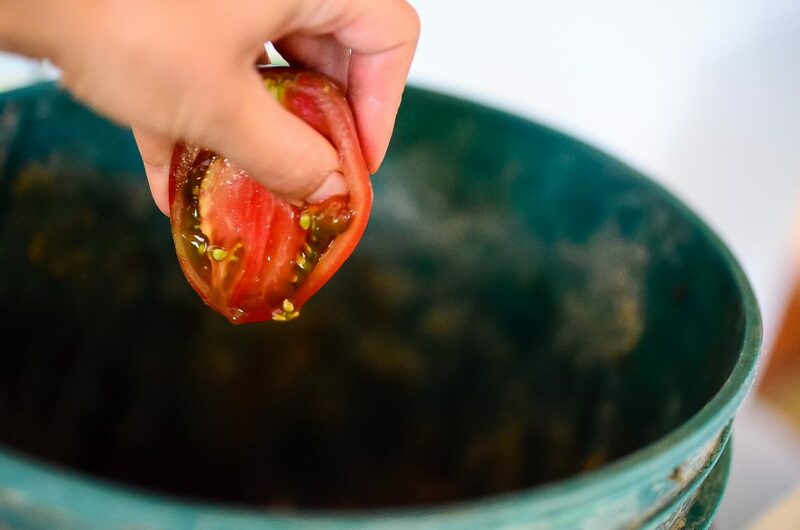 My super fancy method of seeding tomatoes is sticking my thumb into them and squeezing it out over my compost bucket. Ridiculously therapeutic. Dice and sauté until slightly cooked. 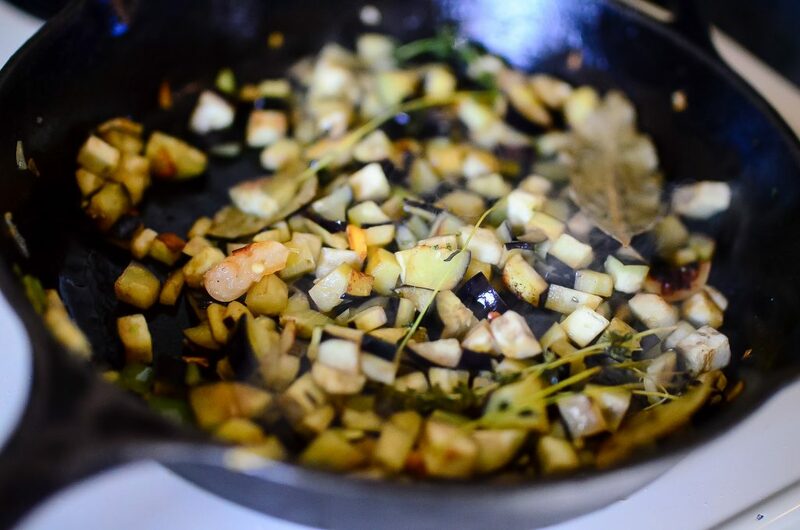 Spoon onto the rest of the vegetables, omitting the thyme stems and garlic cloves. 7. Let’s gently stir to bring it all together, shall we? Salt and pepper to taste. And then, we let it rest. Rest, ratatouille, rest. Meanwhile, I’m going to finish drinking this glass of Zinfandel, cook up a small pot of rice, and pull the chicken out of the oven. 8. Garnish with fresh thyme and freshly ground black pepper. 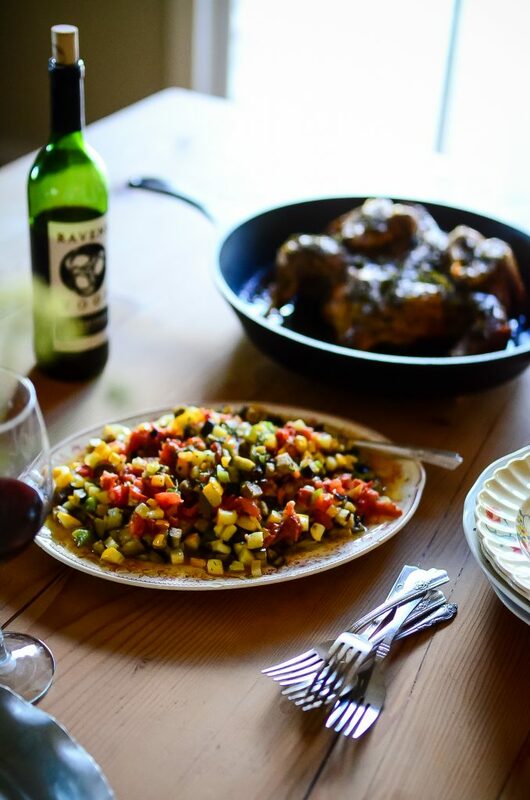 Then, break off the drumstick and thigh from a homegrown chicken, pour yourself another glass of wine, and partake in the best traditional ratatouille recipe on God’s green earth. You thought I was joking about the second glass of wine, didn’t you? I wasn’t. I never joke about wine. 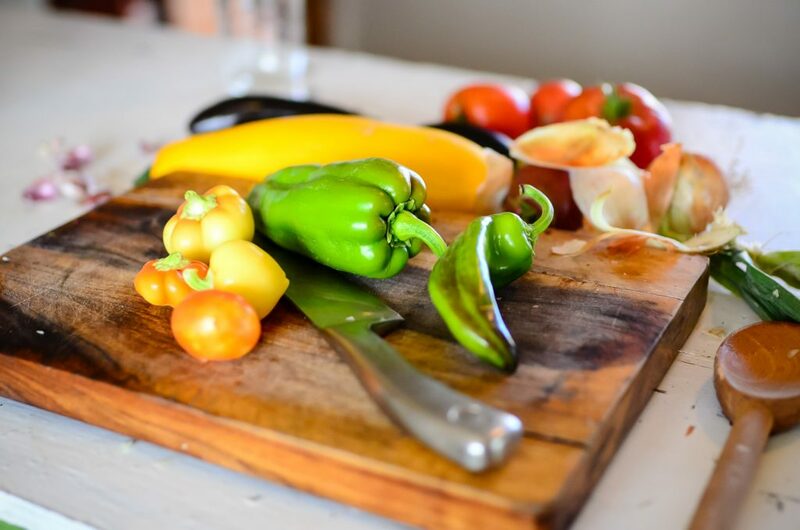 Vegetables are not boring – rather, fresh vegetables at their peak ripeness are a culinary dream. 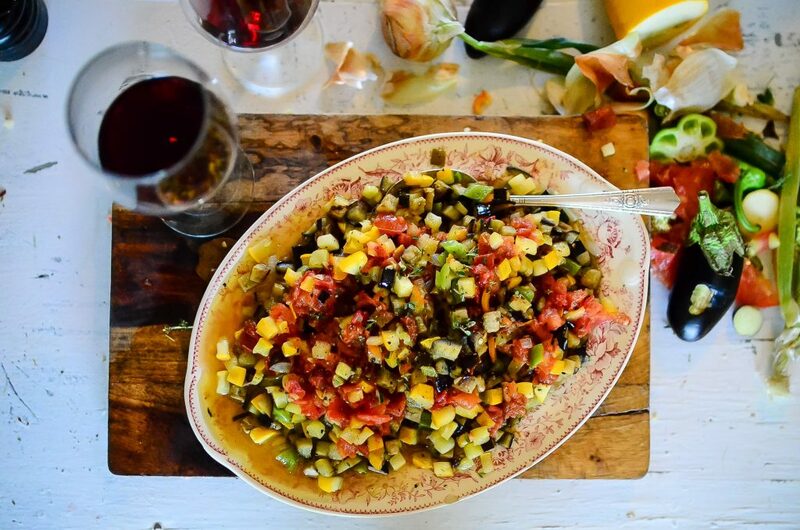 This traditional ratatouille recipe plays on that simplistic magic and turns those inexpensive, overabundant vegetables into something quite wonderful. Heat a medium-sized cast iron skillet up on your stove. Add in the olive oil, thyme, and bay leaves. 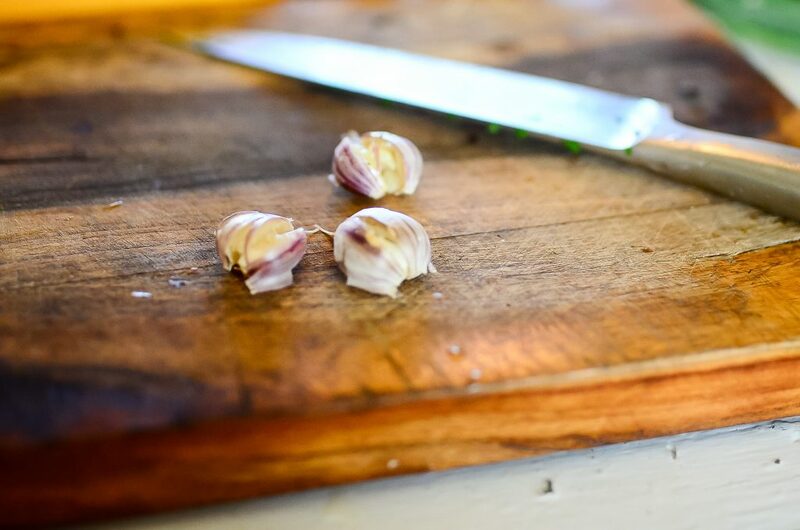 Crush the garlic, remove the skins, and add the whole cloves into the skillet as well. This is our base of ingredients that we will keep in there the entire time. 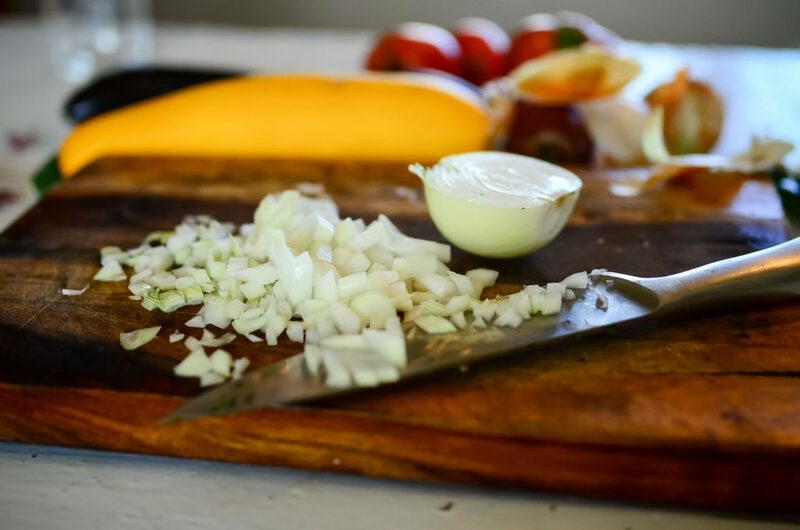 Over medium heat, sauté the onion in the olive oil, garlic, and herbs until just soft. Leave it with the teeniest bit of crunch. Dice the peppers and toss them into the skillet. Add a bit more olive oil, if need be, to keep it all moist and sauté-like. Next, the eggplant. Diced and sauté. Eggplant has a tendency to soak up the olive oil, so add a bit more if need be. Don’t overcook the eggplant! Ain’t nobody like overcooked eggplant. Remove the eggplant and once again, repeat the same process with the zucchini. And lastly, the tomatoes. 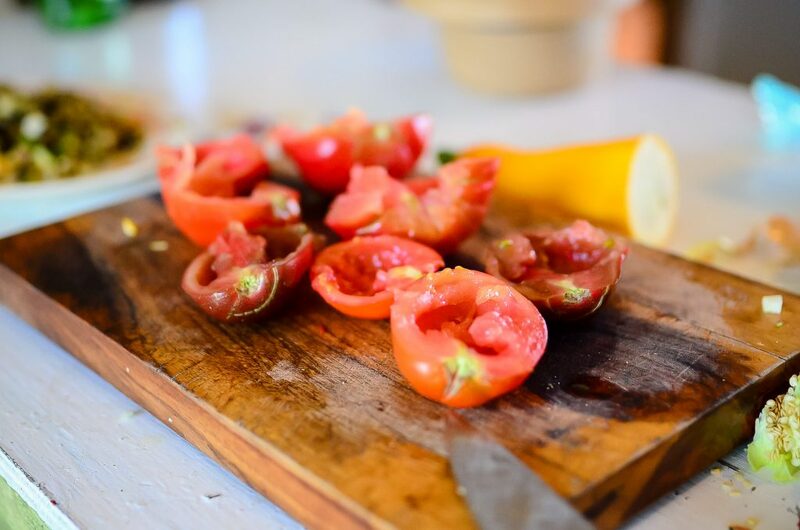 Now, don’t forget this secret: SEED THE TOMATOES. Seeds are wet. Wet is soggy. Ratatouille should not be soggy. Let’s gently stir to bring it all together, shall we? Salt and pepper to taste. And then, we let it rest. Rest, ratatouille, rest. Garnish with fresh thyme and freshly ground black pepper. Very good, Shaye. Everything is just excellent! This looks like heaven! Definitely going to give this one a try once I have a chance to stop by my farmer’s market.